Are you interested in some of the most exotic stories available anywhere? Here are three news items that you will not find in your local newspaper or in Newsweek Magazine either. If you are interested in native culture and how people are doing in very remote and obscure areas of planet earth, read on! We have three news flashes from beyond the edge of the current mass media radar. Due to your continued support, it is all good news!! 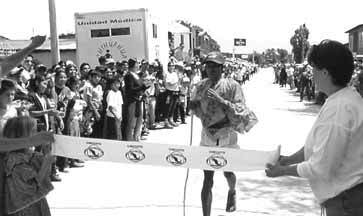 For the past several years I have been getting questions as to how the Tarahumara runners are doing. On July 17 I had the opportunity to meet almost all of our old runners and some new world class runners as well. I am happy to report that everyone was in good health and good spirits. Most of the runners were wearing high status cowboy boots, so it seems they are doing fine in their lives. It was interesting to note, however, that it was the new runners who were wearing the traditional rubber and leather thong sandals who took the top spots in this year's 100 km Sinforosa Canyon Ultra Marathon. In another news worthy development, the Department of Tourism in Chihuahua has been sponsoring the Ultra Marathon for the past five or six years now. I can report firsthand that they are doing an excellent job and are supporting the Tarahumara running culture in a very productive manner. They are providing $1,500 USD prize money for the winner of the race, so the best Tarahumara runners feel it is worthwhile to run. Additionally, our non-profit organization provided 7.5% of the total prize money to show American support for excellence in the sport of Ultra Marathon running. We were also able to provide some valuable cloth and sewing materials, some nice dress shirts, and a hatchet courtesy of David L. Teschner. The race started well before dawn and entered the rough and treacherous Sinforosa Canyon about sunrise. It seems there were about 150-200 runners total. Approximately 25% were Tarahumaras with the remainder coming from throughout Mexico, Latin America, Europe, and even Kenya. The race was very exciting for us as we were in a totally ethic situation where we were the only Americans present. After seeing how Ultra Marathons are run in the USA, it was quite a treat to experience the more low key and less pressured management style of our wonderful Mexican neighbors. The first runners emerged from the canyon just after noon and ran a "lap" on the rim. 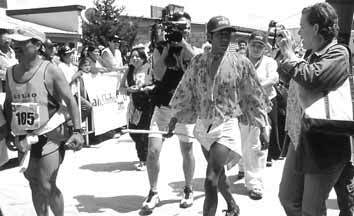 The first place male finisher, Arnulfo Químare, crossed the finish line at about 3:00pm and was well ahead of the next runner who was about half an hour behind. 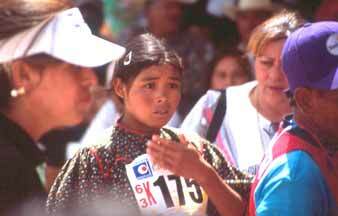 All of the first four finishers were Tarahumaras. 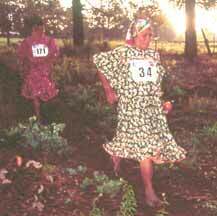 This substantially reinforces the legend of the running Tarahumara. 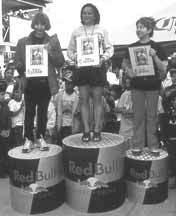 The first place female finisher, Marina Valencia, was from the capital, Mexico City! I regret, for those that are interested, I did not record specific times and details, but rather photographed and enjoyed the event of that day. My co-photographer, David and his companion, Marsha, very much enjoyed the exciting cultural experience. Mariah Sierra Williams Fisher was onhand to help distribute the trophies with Sonia Estrada who was representing the Department of Tourism. All in all, it was a wonderful day! I hope you enjoy the photographs. We had made most of the photos black and white for easier email transmission. If you should have any further questions or interest, please feel free to contact me at any time. I think you will agree that this web site is one of the most comprehensive and beautiful available on the Internet today. Our goal is to support worthy indigenous and ethnic ecocultural tourism initiatives in canyons around the world. Additionally, our objective is to provide the most accurate geographical information and most attractive 3-D color maps in existence today on canyonlands of the six inhabited continents. Anyone viewing this web site, I believe, will readily agree this is a massive project well done. Although it is impossible to pick out anyone person as everyone contributed so much to this highly technical project, I would like to draw your attention to the work of Goro Komatsu as he has provided an insight into the geography of canyonlands that is literally out of this world and as such, exceedingly unique. I hope you will join me in the excitement of adding the canyonlands of Mars to our love of learning and joy of life. 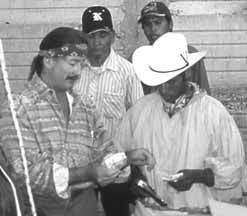 You can look for our Tarahumara newsletter here on this web site in the next week or so. Please pass this site along to your email list. We need all of your support in this regard. If you have any comments, constructive criticisms, or wish to help us in these efforts, please contact me at your earliest convenience. Our fund raising goal for these food deliveries and kindergarten building upgrades is $6,000 USD. During the past eight years Wilderness Research Expeditions under the direction of Richard D. Fisher has delivered over 150 tons of famine relief to the most remote Tarahumara Indians of Copper Canyon, Mexico. In 2004 there have been unusually heavy rains, so for the first time in a decade we may not need to have a specific famine relief effort. 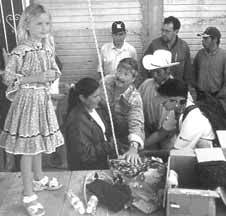 Mexico, however, is in a deep financial crisis and cannot fund the Tarahumara school system effectively. In some of the more remote areas, the boarding schools do not receive the food rations necessary for the school children. This year we are going to focus during the month of November on supplying the much needed food for the remote boarding school and put the finishing touches on our kindergarten project. Last year we had a very enthusiastic group of volunteers who were working to finish the kindergarten project with its associated water system. Our objective this year is to supply the school with food and finish any specifically needed school maintenance and construction. We ask for your kind assistance in this endeavor. We need donations to purchase materials and foodstuffs and to pay for their delivery to the schools in communities in the Sierra Tarahumara. 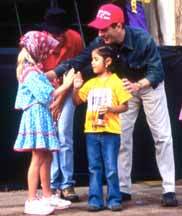 Your donations are tax deductible as we are a non-profit group with an IRS 501(c)3 status.